It is not often we see father figures at the forefront of most genres, since much of anime is geared towards young adults. However, even these often, secondary characters deserve their time in the spotlight. In honor of Father’s Day, here is a look at some of anime’s best dads! Inu no Taisho is not perfect. He did leave one family to start another and thus began a long-standing rivalry between two brothers, but what parent isn’t a little flawed? At least he’s not Naraku, right? What makes Inu no Taisho a good father is that he realized his mistake and took measures to ensure his sons walked a righteous path. Inu no Taisho understood who his children were at their core and prior to his death, made sure there were measures in place to help them grow as men after he was gone. It is because of Inu no Taisho that Sesshomaru learns to love and value life. In a way, Inu no Taisho’s faults teach Sesshomaru how to be a better father figure and caregiver to Rin. Inu no Taisho is also the one who gives Inuyasha the power to protect the ones he loves and fight for justice. Again, Inu no Taisho was by no means perfect, and his children have attested to that, but he recognizes his transgressions and does what he can to make it right. Besides, one of the most important things Inu no Taisho’s sons accomplished was establishing a relationship between humans and demons, which was a bridge that Inu no Taisho himself began through a series of fatherly mistakes. Like Inu no Taisho, Spirit is not without his faults. By the time he was 18, Spirit was married and blessed with his daughter, Maka, but marriage wouldn’t last long. Unfortunately, Spirit was a notorious womanizer. That said, Spirit, like Inu no Taisho, realizes his mistake of promiscuity and carries an immense guilt for losing the woman he loves. Where Spirit failed as a husband, he never faltered as a father. Spirit often read to Maka as a young girl, inspiring her love of reading. While Maka blames Spirit for the destruction of their family and often scorns her father, Spirit remains vigilant in his duties as a father. He supports his daughter at every turn and risks his life to protect her. He knows he can’t make up for what he’s done to his family, but in spite of everything, Spirit is the one who maintains a constant and positive presence in his daughter’s life. Unlike the previous fathers on this list, Gohan’s reputation and character remains unsullied. In terms of father figures in the Dragon Ball universe, Gohan is the only exemplary dad—though Krillin and Mr. Satan come in a close second—or Piccolo if you want to count that. Gohan is easily one of the most powerful characters in the series and promises to be an excellent warrior like his father before him, but Gohan, despite his love for fighting, gives it all up for the sake of his family. Gohan becomes a scholar and puts being a father and husband before all else. Even when Gohan fights, his driving motivation is protecting his family from evil. Gohan desires to be fighter like his father. However, he sacrifices this dream without regret or sorrow as a young boy. In his mind, the life he’s made with Videl and Pan is greater than any other dream. Not all great fathers are the biological sort, and Shiro Fujimoto is proof. Rin and his twin brother Yukio are the sons of Satan and Shiro, a priest and an exorcist. Shiro loved Rin and Yukio with all his heart as if they were his own children. Shiro is willing to sacrifice anything for their sake. From chain smoking to ultimately giving his life, nothing is too much to give if it means protecting his boys. Shiro’s influence on Rin and Yukio’s lives is evident through the various character traits each of the boys took from Shiro and the lessons he shared. 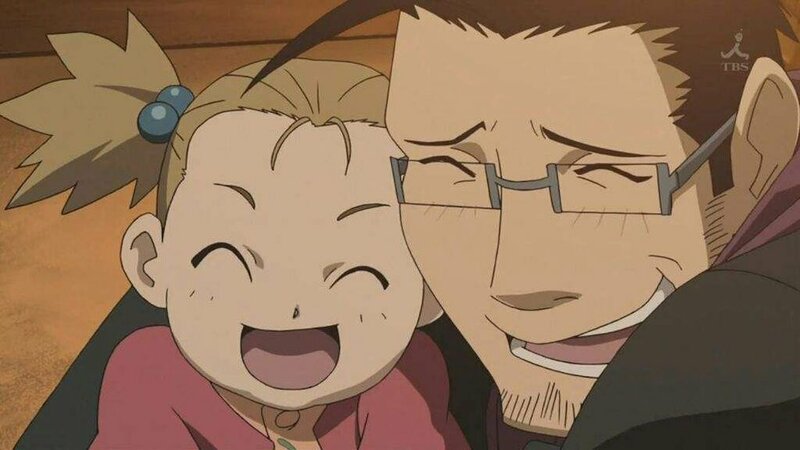 The reason Maes Hughes’ death hits so hard is because his time as a father and husband is short lived and the possibilities of what he could have done for his daughter go unrealized. Maes is the type of father people like Roy Mustang dread, because every waking moment of Maes’ existence is dedicated to sharing his overwhelming love for his daughter—sometimes to the point of annoyance amongst his peers. While Maes’ kindness and attentiveness toward others is also a major part of his character, he’s most remembered for bragging about his daughter and showing off photos of her at every turn. His world is centered around his family above all else. Elicia is without question the light in Maes’ life and vice versa. She is all he can talk about most of the time, and when they are together, no one smiles brighter than them. Despite Maes’ kind and helpful persona, he’s very protective over Elicia. So much so he is willing to draw a gun on a group of boys who want to play with her, insisting that if they try anything funny, he’ll come after them. It’s Maes’ love for Elicia and his wife Gracia that make his death so heartbreaking, because without him they’re both missing a big piece of what once made them happy, a father and a husband. Like all lists, this is only a small ripple in the water. Anime is filled with wonderful dads like these and many others. In recent years, some of anime’s greatest protagonists have gone on to become father figures, like Naruto and Ichigo Kurosaki. There are also a sea of other types of dads too. For example, the ones that have good intentions but sometimes get their priorities mixed up—looking at you Goku. There is also the opposite end of spectrum, dads who should just not be dads, like Gendo Ikari from Evangelion or Dr. Tucker from Fullmetal Alchemist. Anime, just like life, takes all kinds. Whether they are good or bad, there is a father figure out there for everyone.